Between the release of new, incriminating emails and the fact that every time she opens her big mouth something stupid falls out, this might actually be the smartest thing Hillary Clinton has ever done. Of course, dropping out of the race and leaving America alone would be far better, but hey, any day without the relentless nagging of the Wicked Witch of the West is a win in my book. She’ll be headed to a fundraiser tomorrow and the third and final debate with Donald Trump… but for the remainder of the election, she will not be campaigning. […]She’ll fly out to San Francisco for a fundraiser on the 13th but will not appear in public between the 10th and the final debate on the 19th. Her campaign schedule runs through the 23rd, and she has no further events planned. 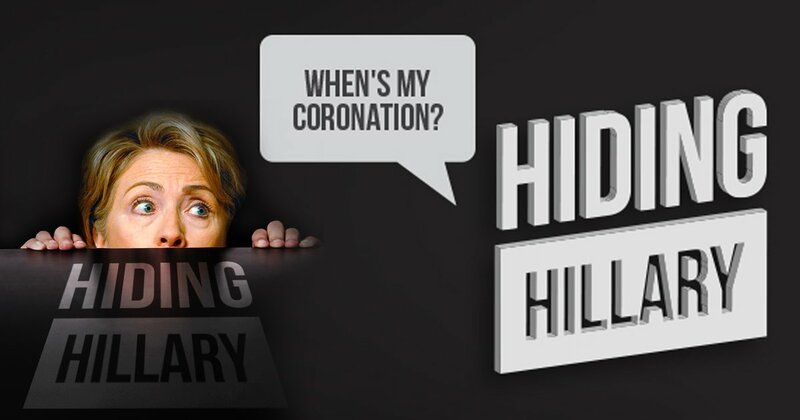 Apart from the two events this Monday and the 90-minute debates on the 9th and 19th, Hillary will not show her face for twenty days. It’s unknown whether this is due to her health, or other personal reasons, but the departure from the spotlight gives Trump the opportunity he’s been waiting for. He can finally go on the attack without needing to feel defensive. If it were up to me, I’d tell him to make a plan to hit every swing state twice within the next 20 days and really get his message out to as many undecided voters as possible. Since the release of the controversial hot mic recording, Trump has been doing a lot of damage control. He needs to stop that and cut right to the bone in a non-stop campaign blitz. Meanwhile, Hillary will quickly fade into irrelevance in this age of “out of the headlines, out of mind” mentality.